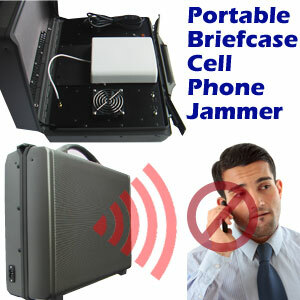 The Cell Phone Jammer model MS6-2 is a portable jammer built into a briefcase. RF Jammers we build into this type of case jam in one direction only, making it a directional cell phone jammer for use in offices and business environments. This Cell Phone Jammer concentrates its jamming beam where the user aims it. Simply putting the briedcase on the floor or desk and point it toward an area will jam approximately 15 + meters away. Where can the Cell Phone Jammer operate? It has jamming bands the operator can switch from, enabling the operator to use it anywhere in the world. Just make sure the desired jamming bands are selected. Many users have recommended directional RF Jamming, built into a briefcase, so the system may be moved from room to room without having to be mounted. The system comes with a rechargeable battery as well as a mains connection for recharging. 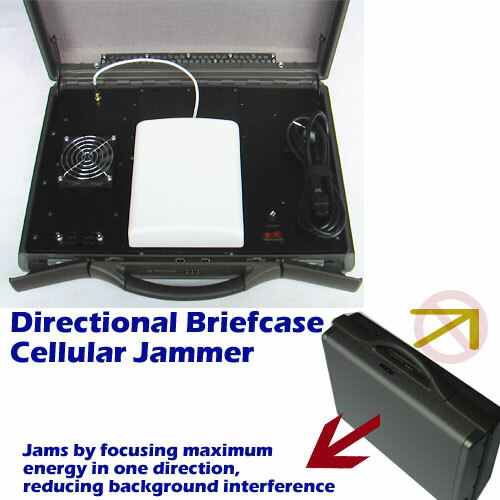 For more information on the Cell Phone Jammer as well as other RF Jammers built into a briefcase, Contact Us.